Although it’s a nice feeling to gather wild dandelions, birch bark, and purslane for my kitchen, I really need to give credit to the serious foragers and creative harvesters. Look at those who collect food from the rough and rocky coast of Maine. Off those shores, Maine Sea CoastVegetables harvests a whole range of sea weed, algae, and Irish moss. I was reading the serving suggestions on a package of their kelp, and came across some interesting ideas. Primarily Atlantic kelp can be used just like Japanese Kombu, for soups, wrapping meats, and gently curing raw fish. But along with using the kelp in soup or toasting it for chips or salads, they recommended adding it to any pickle recipe. So why not add it to some fermented pickles? I was excited from the success of my lastbatch of kimchi, and eager to get another pot going. So I sliced up a sheet of dried kelp into skinny strips, and mixed it with sok; the blend of fish sauce, chile paste, garlic, and ginger for seasoning kimchi. 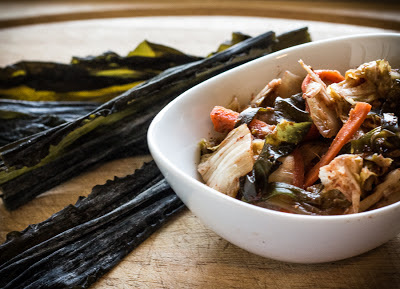 After a day in the brine, the kelp had softened and swollen in size, leaving long, fettuccini-like strips of dark green kelp twisting between pieces of chopped napa cabbage and julienned carrot. I tasted it after about eight or nine days of fermenting at room temperature and the kelp had a soft but slightly chewy texture. It had infused the kimchi with a delicate flavor that worked very well with the maritime flavors and aromas from the fish sauce. I had worried the kelp would get tough, but it added a really pleasant texture to the cabbage and carrot mix. 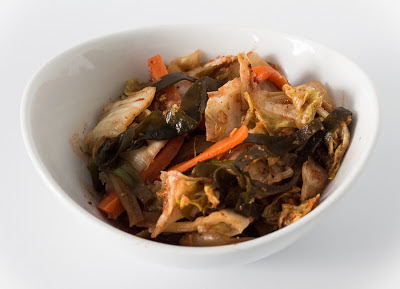 Plus, like many types of seaweed, kelp has naturally occurring glutamic acids, which helps to make the already vibrant flavors of kimchi more intense and savory.